The Elinchrom RQ Ringflash is a dedicated ringlight for Ranger Quadra battery power packs, so you can bring the distinctive "shadowless" ringlight look out of the studio and on location with you. This lightweight (4.1 lbs/1.9 kg) light has a 4-pole flash tube that delivers a movement-freezing 1/2600 sec. flash duration at full power. The 6.5' (2 m) cable, ergonomic handgrip and 3.9" (100mm) internal diameter make it a natural for location work with medium format or SLR cameras. The RQ Ringflash can be used only with Ranger Quadra Battery power packs. RQ Ringflash is rated 4.3 out of 5 by 3. Rated 5 out of 5 by matgay from one major flaw... first this is an amazing pure white flash and highly portable ringflash. 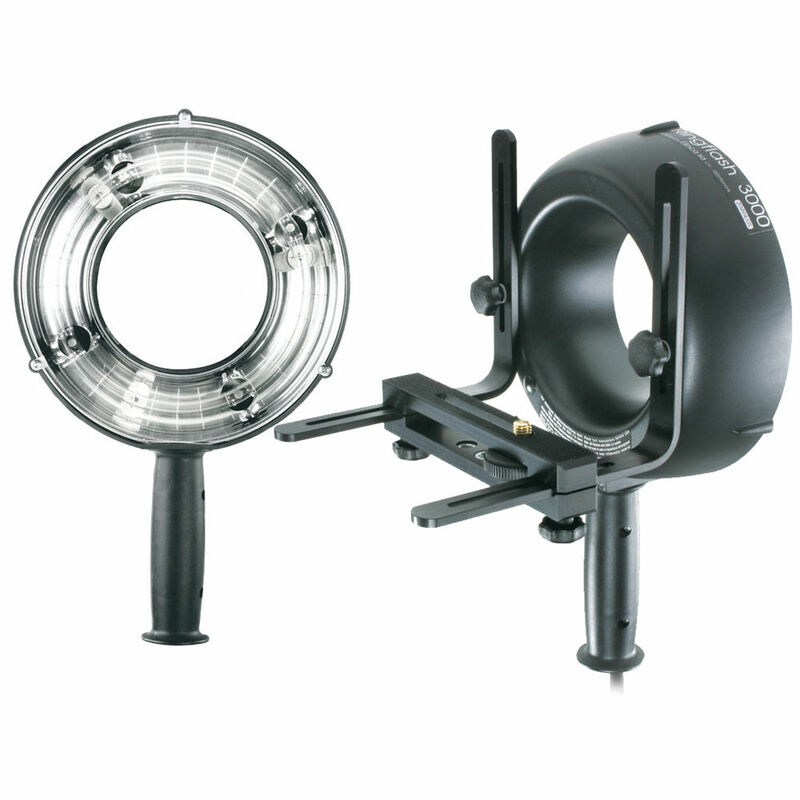 i use it with the hensel 14-inch ringflash beautydish, and matching hensel rf grid. i also use two speedlights by radio control so i can light the backgrounds. Or i can attach a speedlight on camera and aim it straight up into the ceiling to light the room, while the ringflash lights my people. at first i used the elinchrom rangers, but they are much to heavy, so i moved to this unit with the quadra rx pack and it is amazingly portable. i have it around my neck and mounted to a detachable monopod that i can take anywhere by myself, no need to setup for any cumbersome lightstands. amazing to use for wedding events. this setup is practically a moving studio on legs. now there is a major flaw in the design, and it is not the flash itself but in the mounting. where there are 5 screws that assemble the unit, there are NO notched measurements along each opposite sides. Without the notches, you need to guess the alignment of both sides, and it is very difficult and time consuming to line up symmetrically. Without notches on both sides, the alignment is always a little crooked. How much more could it possibly cost the production to add notched measurements to the up/down slider, and the forward/backward slider, and the camera mount slider? Now I have to deface vandalize the unit and etch in the notches into the aluminum metal mounting. Rated 4 out of 5 by Anonymous from Love this product Easy to use. Clean beautiful light! Sometimes the handle gets in the way, especially if you shoot low to the ground. Is there a modeling light on this ringflash?